A twenty-foot-long, mutated monster-fish is loose in Phantom Loon Lake, Ontario, thanks to a top secret government conspiracy to design a Freak Species of Mass Destruction! Crabby old angler Jack Nadler is thrown together with a whacko cast of cartoony characters, including the most grizzly professor to ever wrestle alligators, a fish-whispering archivist of native culture, a world-renowned illusionist, a high-tech stoner security guard, and a super-stinky living text of a turtle. With some help from Canada’s most massive catfish, Old Shithead, his lovely bride Big Momma Shithead, and a polysorbate found in Twinkies, the New Shithead Liberation Front takes on dastardly bastards, villainous sidekicks, and a gun-loving club of Evangelistic terrorists in order to rid the Natural World of a Deadly Scourge that threatens to wipe out Everything! As the knee-slapping, action-packed sequel to the cult-classic Bottom Feeder (Creative Arts, 1999), this environmental epic of Good vs. Evil & Troubled Tween vs. Fish takes place in a #blogosphere coming to terms with its mythic past. Meanwhile, a millennial rebel orphaned by meth seeks her place in a borderland of phantom zones, ancient spirits, and armed drones exploding in the sky! Mark Spitzer’s writing is humorous and engaging, and exudes the charm of life-as-play while not disregarding the deeper concerns of contemporary life. In Garapaima, Spitzer creates a hybrid vernacular, both old-timey and postmodern, to spin a semi-absurd fishing yarn about the efforts of the New Shithead Liberation Front to soothe the existential angst (and environmental danger) of a Frankenfish created as a secret government weapon. Suffused with a morality of community eco-awareness, the narrative itself seems conscious that it’s no more farcical than the evening news, and it certainly contains more nuggets of pithy truth. With good humor and high hopes, Spitzer combines the existential struggles of The Old Man and the Sea with the eco-consciousness of The Monkey Wrench Gang, and the youthful energy of The Hunger Games to create Garapaima, a novel that understands the stakes in these grim environmental times. The unlikely protagonist, old Jack, “stiff as beef jerky,” protector of catfish and enemy of Frankenfish, shows the next generation of eco-rebels how it’s done. We already knew that no one writes better nonfiction about fish than gar madman-expert-enthusiast Mark Spitzer. 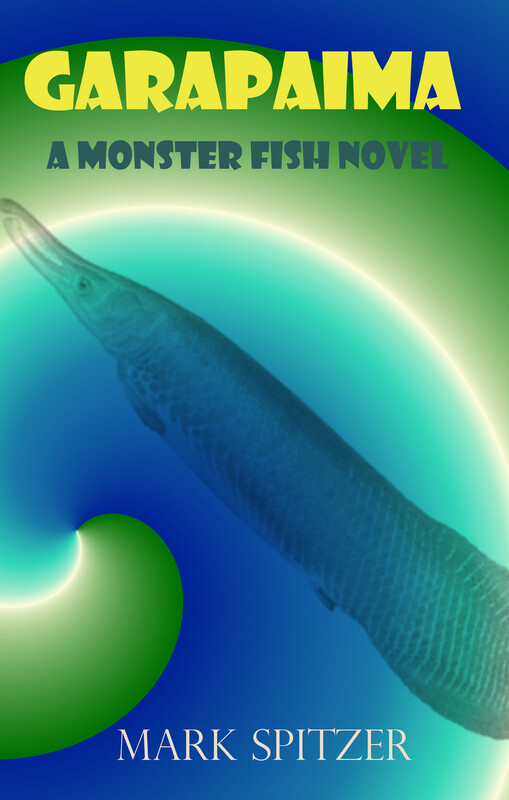 Now with Garapaima, Spitzer proves himself to be king of the fish novel as well. This book is a singular romp–with a heartbroken illusionist, a magical Native American songstress, a burly shape-shifting poet-professor, a stoner security guard techno hero, a hair-dyed tween up on every LGBT issue, an all-knowing talking turtle, a bevy of conspiring government bad guys–and, oh yes, fish! Lots and lots of fish! Indeed, the fish prove to be the real heroes of this hilarious, fast-paced eco-thriller. They are more thoughtful than thinkers, more profound than philosophers, more human than humanity. Fish whisperer that he is, Spitzer is able to read the minds, hearts, and souls of these creatures he loves so dearly and at the same time place them at the epicenter of this hard-charging, action-packed, and even heartwarming story. You’ll laugh out loud at every crazy turn of plot, but you’ll also feel on each page Spitzer’s overriding concern for these, our water-hugging brothers.